How old is impantology? Already the Maya culture knew mineral implants. What is it good for? In the edentulous jaw we can place artificial roots. These roots will support the abutments wich may serve like a prepared tooth or as an anchorage for removable prosthesis. How we do it? It is done in four phases. Exposure of implant and placement of abutment. Abutment included in the price of the implant. Placement of porcelain crown, bridge. The very first step is to make diagnostics to get information of the general health and the bone at the site of the implantation. Please check this page below to have details of the diagnostic process. You need to be in good health, but you do not have to be an astronaut..
A panoramic X-ray tells a lot about the condition of the teeth. Here all the teeth has to be extracted. 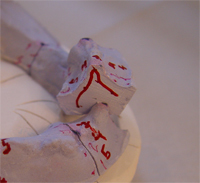 We make a plaster modell of the jaw and a vacum formed splint on the modell. This splint will hold 8mm diameter steel balls. A new X-ray is made with the steel balls in the mouth. Now we can digitize the picture and easily calibrate it. We measure the thickness of the gum and draw the results on the cross-sections of the plaster. This way we get the shape of the bone. The digitized X-ray will be processed in our special software. The result is displayed on the screen during the teatments. 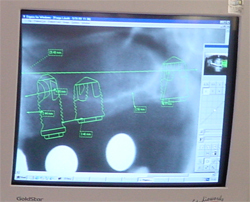 In the software we make a precise digital plan of the implantations. At the end of the diagnostics we know the thicknes and height of the bone. We are able to make realistic plans of the position, number and size of the necessary implants and the extent of the bone replacement. Due to the laboratory tests we have informations about the general health. The right lower first molar was missing. The adjacent teeth are or have small fillings. The framework of the crown on the abutment. The crown on the plaster modell. The eating was quite a problem for our patient. We placed two implants on both sides to restore the chewing functions with bridges. The abutments in the modell. All molars and most of the bicuspids are missing. The bridges on the plaster modell. The happy smile of our patient. Our patient is a young gentleman in his thirties. He lost his bicuspids and molar teeth on his upper left. The bone was too narrow to implant on this site. We placed artificial bone (Bio-Oss) in the sinus and inserted the implants. 8 months later we put a bridge on the helaed implants. The diagnostic X-ray shows narrow bone on the upper left. The bone is enough to support the implants during the healing if additional bone will be placed to increase the bone thickness. The artificial bone increased a lot the bone thickness. Occlusal view of the bridges. Lateral view of the bridges. Our young female patient has decidous teeth at the place of the upper lateral incisors. The arrows show the short roots of the loose decidous teeth. The implants and the abutments are in place. Gold is the best material to cast, because it is extremely precise. The framework in the mouth. The technician uses artificial gum on the plaster model to shape the bridge at the margins properly. The lady on the pictures has not only toothless jaws, but also an assimetry of the face that made the planing a bit complicated. The lower and upper teeth were removed. The lower denture is always very unstable. The financial limits forced us to make an implant bridge on the lower jaw and a full denture on the upper. The lower lip is not paralel with the horizontal plane. A detailed esthetic treatment plan was necessary. The upper bridge and the teeth are in very bad condition. All of them will be removed. The framework on the plaster model. The upper denture and the lower bridge are in harmony with each other. The implant bridge is ready. The removal of the upper ones is done in a second stage.